This tutorial is based on the previous one. Therefore the basics will not explained. 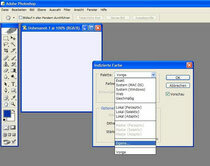 You install the programs listed above with the given installation routine and as mentioned in the previous tutorial. 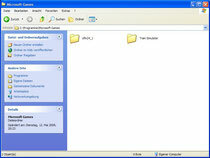 With exception the Shape File Manager. 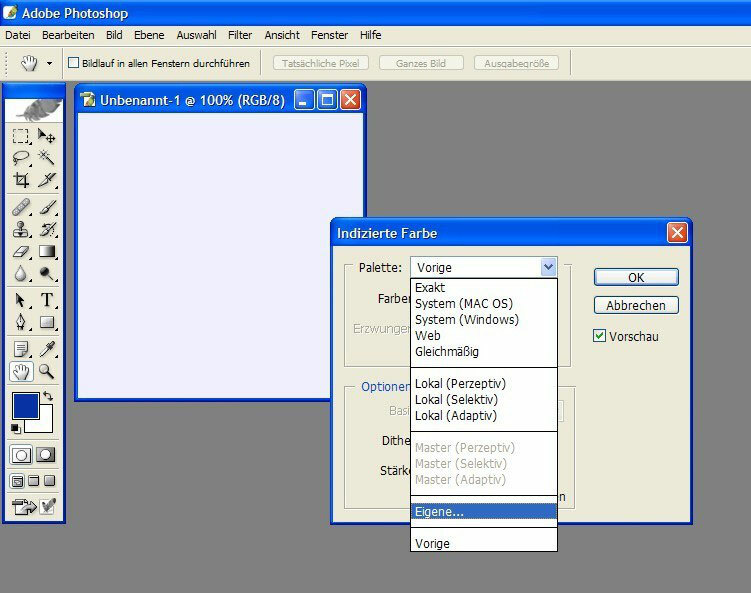 This program cannot be installed, this have to be placed and integrated at the right location. 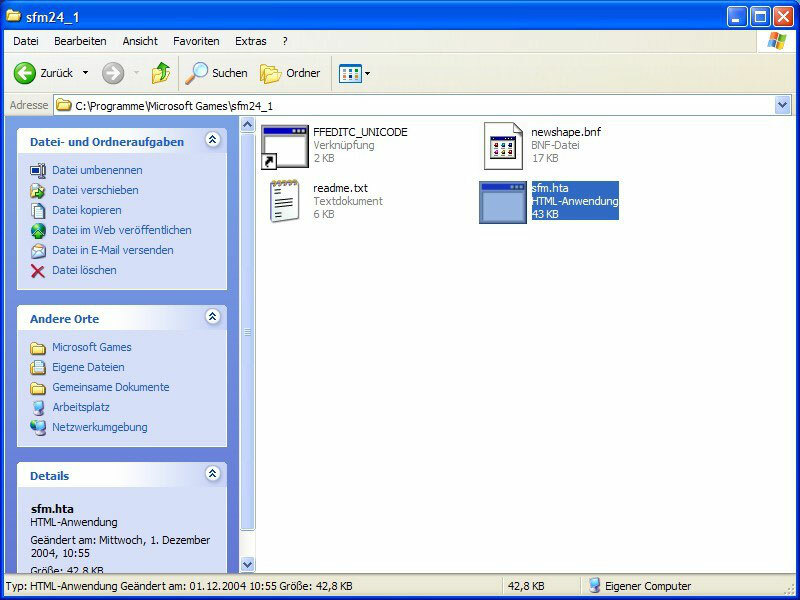 Make a shortcut from the file "ffeditc_unicode.exe" and put it in the folder. 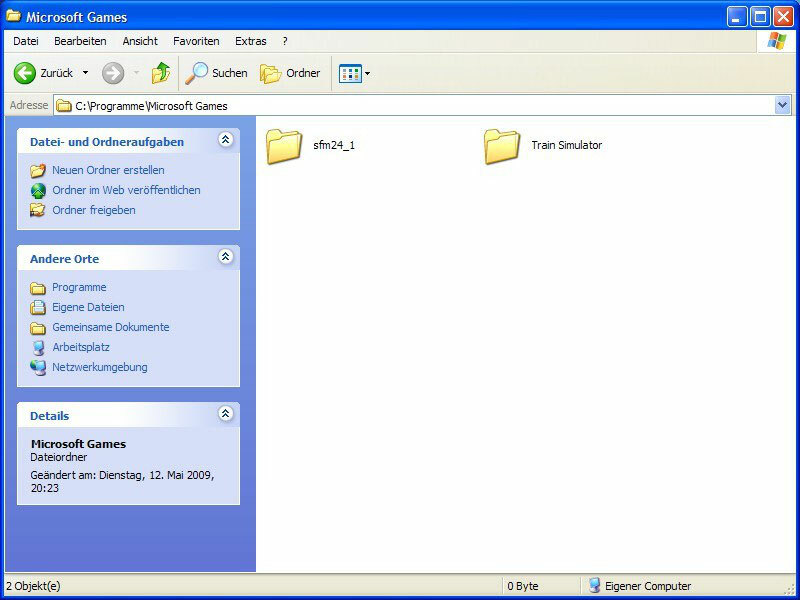 You find that file on C:\Programs\Microsoft Games\Train Simulator\UTILS\FFEDIT. 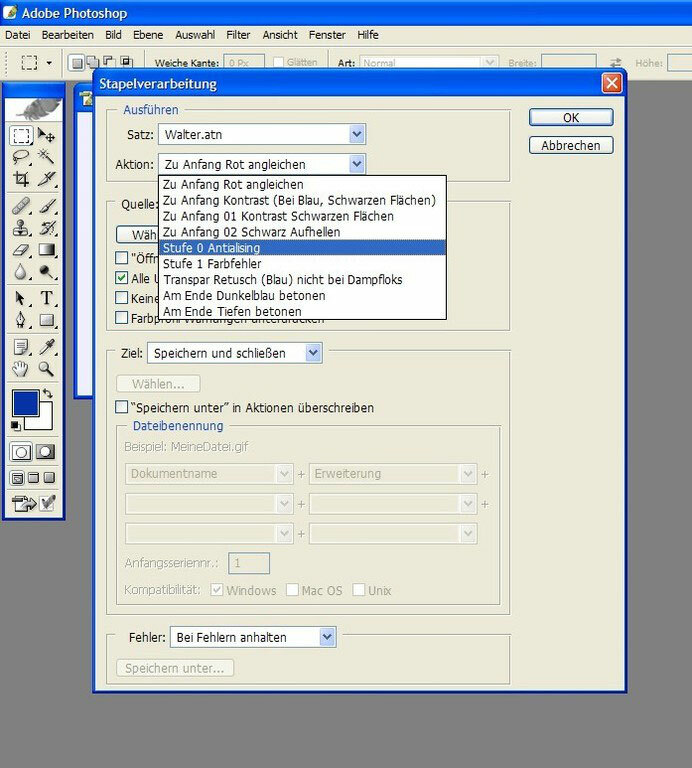 Then open the programm "sfm.hta". It is actually an HTML application. For secureness you click on the field "Click here if FFEDITC_UNICODE.EXE is not in the default location" and search for this file manually. The program is ready for use. 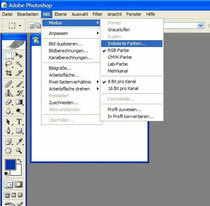 Before we can start properly, you should load the following files and move them in the right folder of Photoshop. 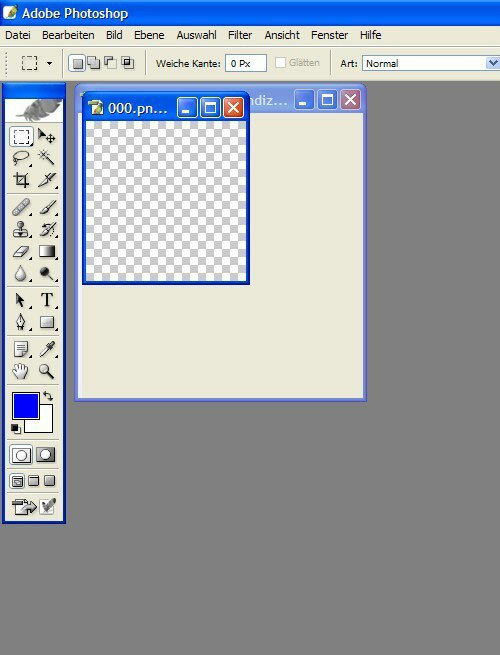 After opening Photoshop, you usually have windows on the right side. Look for the action tab. On the right you can see a small arrow. Push it. The menu will appear, in which you can add actions. 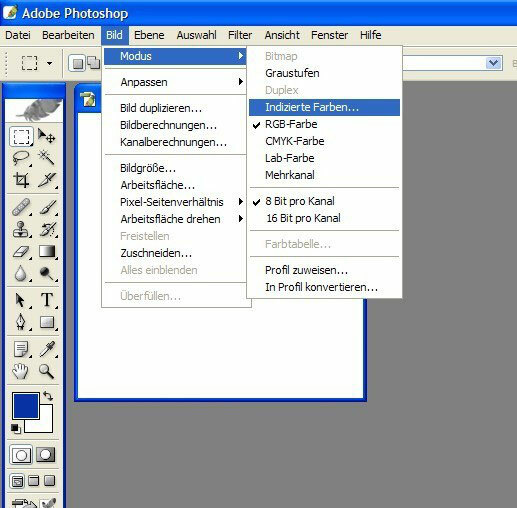 If that's done, you can close Photoshop for now. Now we're ready to build a new model. of the size to the left to 20. Therefore the measuring template makes no sense. You should orient at the edges left and right. It should not be hidden during rotations. Don't forget to make the hook on the right light and then you're ready. Wally would come as next. But this program is not needed anymore. Instead we need to edit the images with IrfanView or something similar to convert from .bmp to .png. So start the program and click on "File". Now search for "Batch-Conversion". 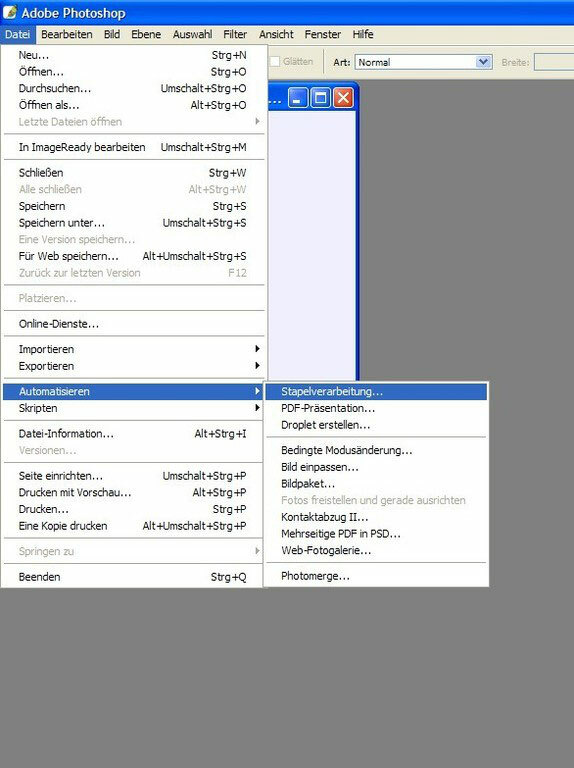 A new window opens with many confusing buttons and fields. First you need to work as "Batch conversion". Next step, search for .png. 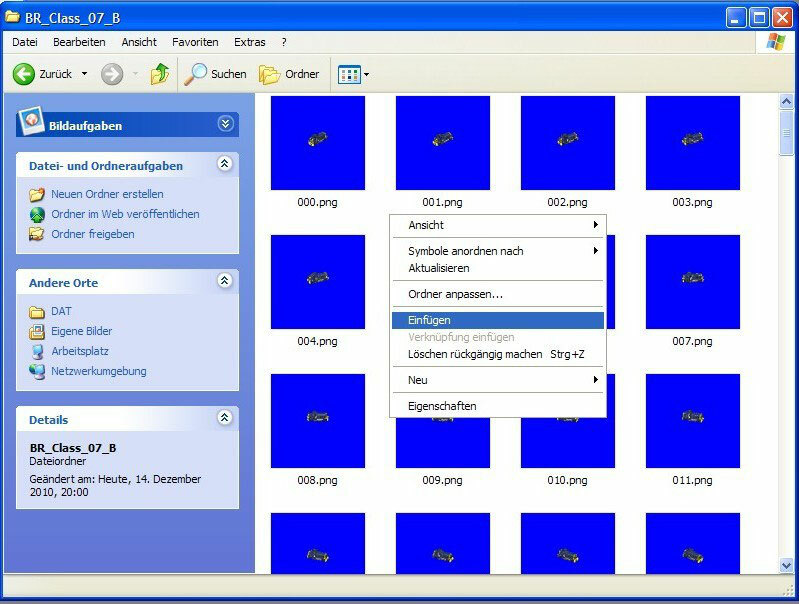 On the right you search for the folder, in which the images to edit are located. Below push the button "Add all" but only one time! 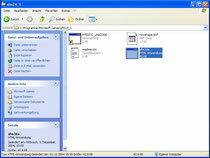 Further left: Choosing the target folder. 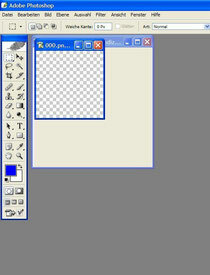 Remind yourself to the first tutorial, we made a folder DAT and another folder in it called PNG. That is our target. The exact reason will be clear soon. 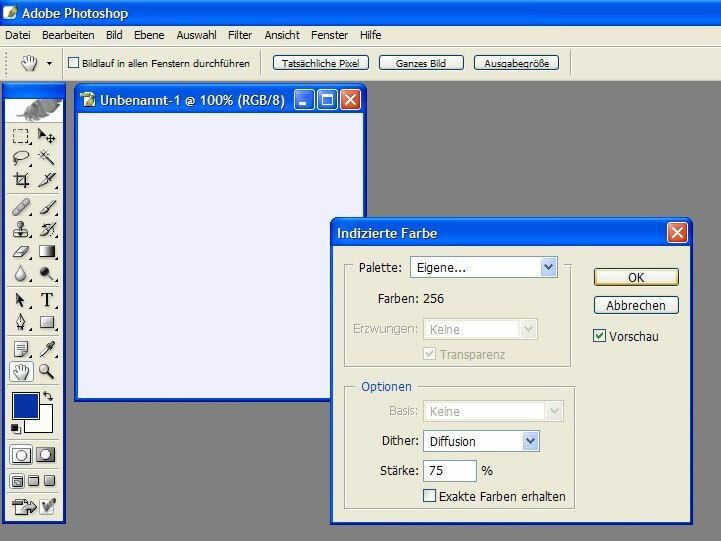 When you done that, press "Start Batch" and this window will appear. Well, now you have converted your .bmp's into .png's and you can delete the .bmp's. Let us begin with Photoshop. 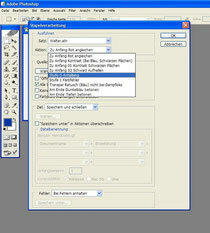 Open the program and make a new image. Next up click (look at the left picture) on Image -> Mode -> Indexed Colors. In the palette you search for "Own ... ". Now you just have to confirm and the Locopalette is loaded. Hereafter you only have to choose your own palette but the loading is unique. Up next, click on File -> Automate -> Batch. Now search the set "Walter.atn" (At the tab "Play"). There you'll find everything needed. 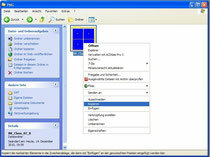 Choose the target folder. In our case the working folder PNG. Then make a hook at "Include All Subfolders". The red models will be explained later. Making the contrast and colours brighter is usually used for steam locomotives. Except you have a very dark model. If not, we start with "Stufe 0 Antialising". 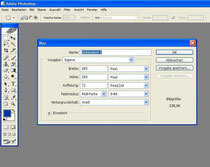 Now you can see how the images are going to processed. Perhaps that will take some time, depending on your computer. 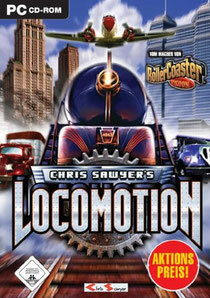 When it's done, the model has the correct size for "Locomotion". 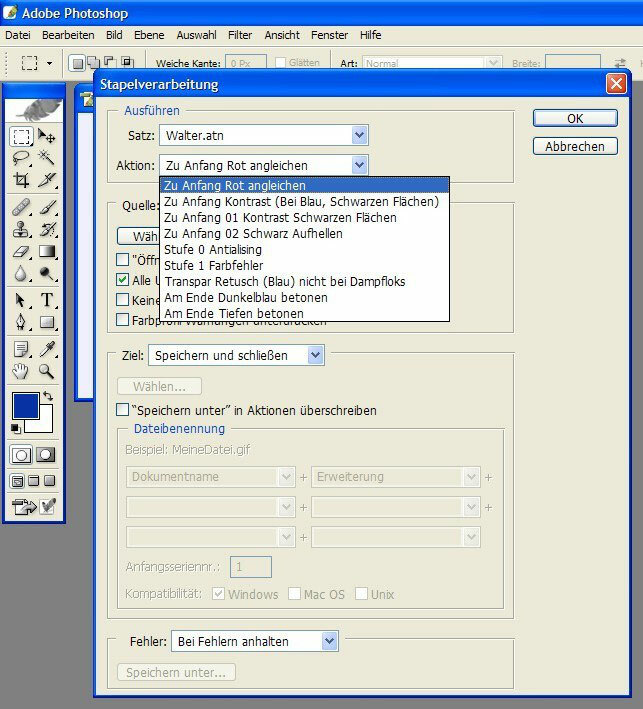 Make a backup of the image folder and put it somewhere else out of the working folder PNG, because everything in it will be edited. Now back to File -> Automate -> Batch. 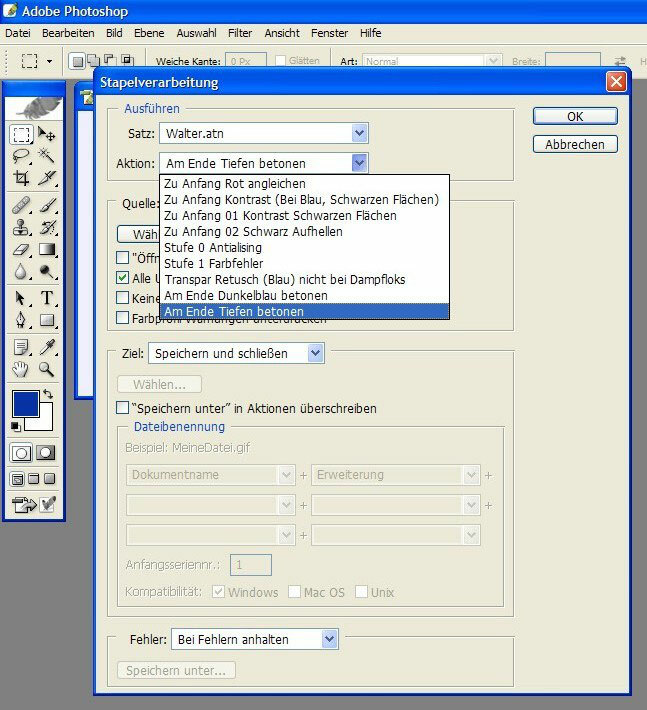 But this time, choose the action "Stufe 1 Farbfehler". The time for processing is now shorter than before. 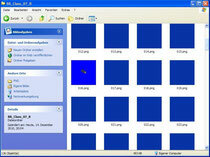 Every complete blue picture you do not find will produce a new error and you have to start from the beginning. If you've done that, cut out the rest. Now switch to your backup folder and paste them. Let it absolutely overwrite! The working folder is now empty, now copy all images from the backup folder and paste them into the working folder. 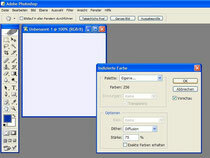 Then File -> Automate -> Batch and start "Tranparente Retusche". 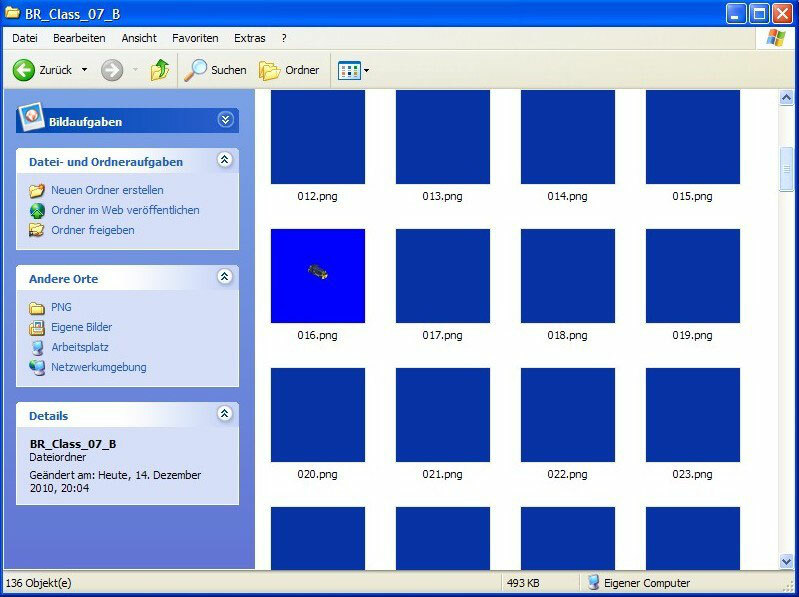 After that, there will be many blue images. 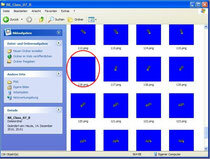 Therefore you should seek for the non-complete blue images and cut them out. 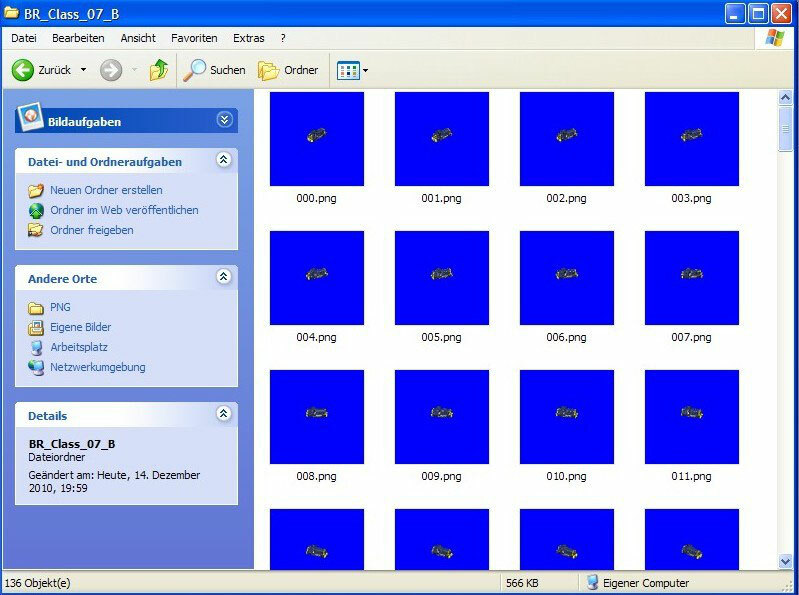 Now go to your backup folder, paste them in and delete all complete blue images in the working folder. Next copy all images from the backup folder and paste them into the working folder. 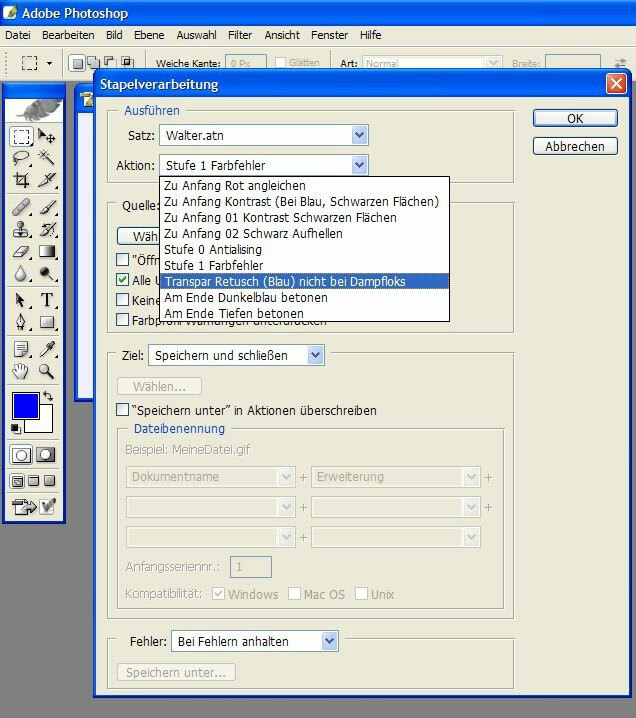 Last but not least: File -> Automate -> Batch and start "Am Ende Tiefe betonen". 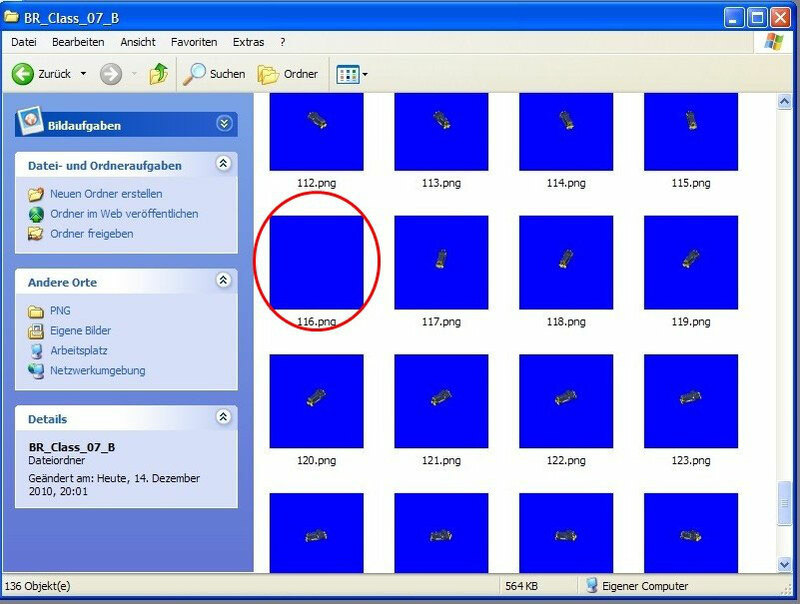 When that's done, you have a set of blue images in your working folder for your vehicle. Then we continue as usual with the Vehicle Creator. 1. At the beginning just edit one vehicle. If you think you're secure in dealing with it, you can edit more vehicles at one time simultaneously. 2. 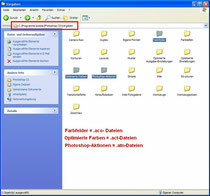 You can create more folder for backups e.g. if you made a mistake you have another backup. 3. Do not hesitate to mail me if you have questions or something isn't clear. The red models make an exception. This is a critical colour in "Locomotion". 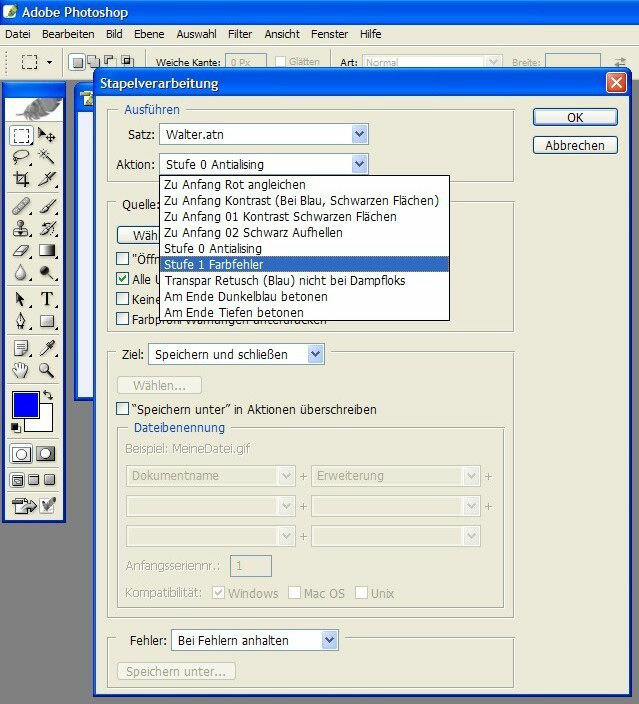 Therefore there is an own editing action in Photoshop. The work process will be the same before you use Photoshop. This time we need the first action "Zu Anfang Rot angleichen". 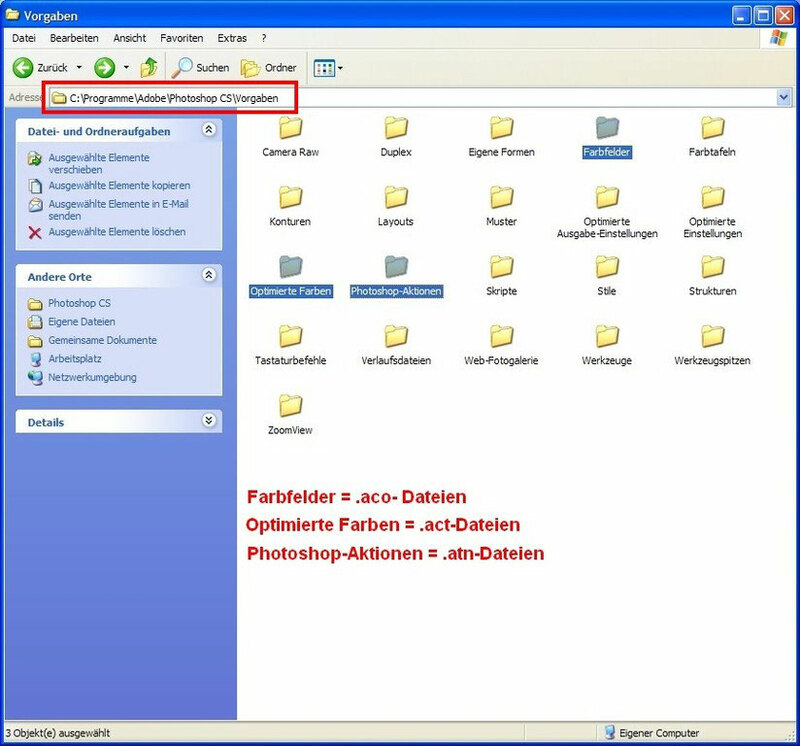 So make a backup but not in the PNG backup folder and start the action. In the best case we will not find red images (all were adjusted), or at worst the half of it is red. They haven't been adjusted and you can take the missing ones from the backup. The rest works as it is described above. Bilious green is making problems too. 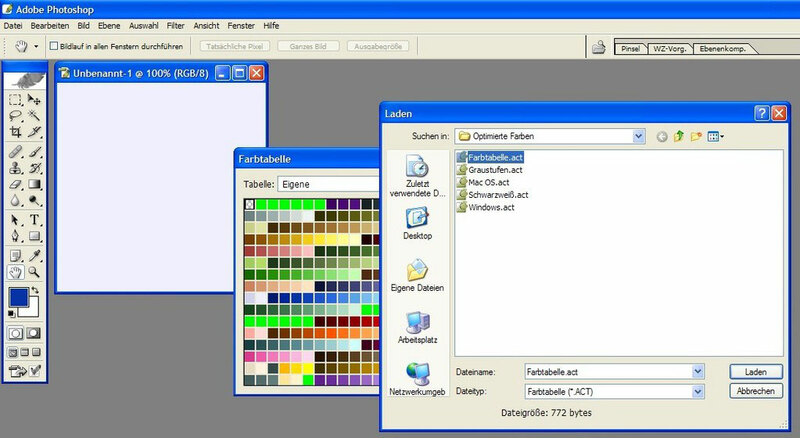 Therefore there is an action at "Farbbearbeitung.atn" which is called "Am Ende Locoleuchgrün entfernen". At that point you must work as like with the red ones. 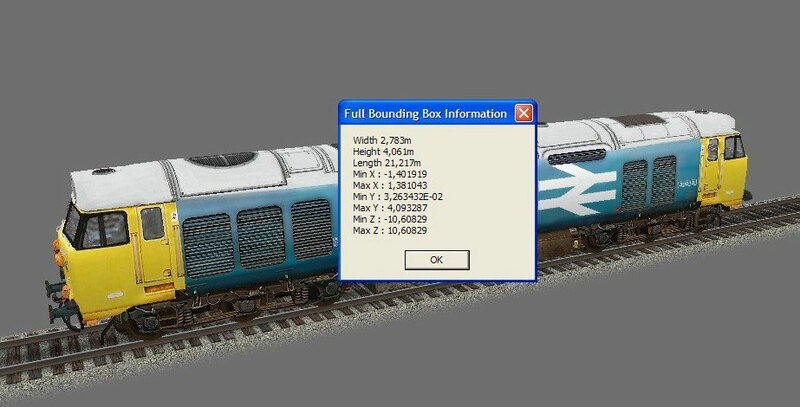 As already suggested, the vehicles have to be under 18m long. You will see it in MSTS2loco when the vehicle is hidden because of its length. 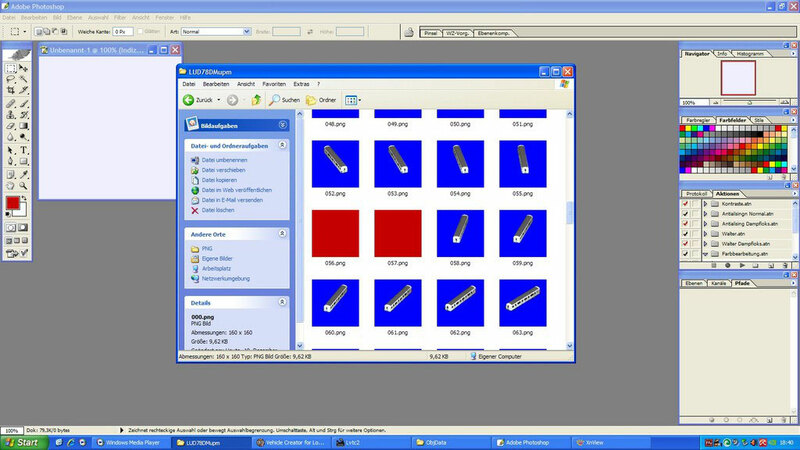 Now we need the Shape File Manager. 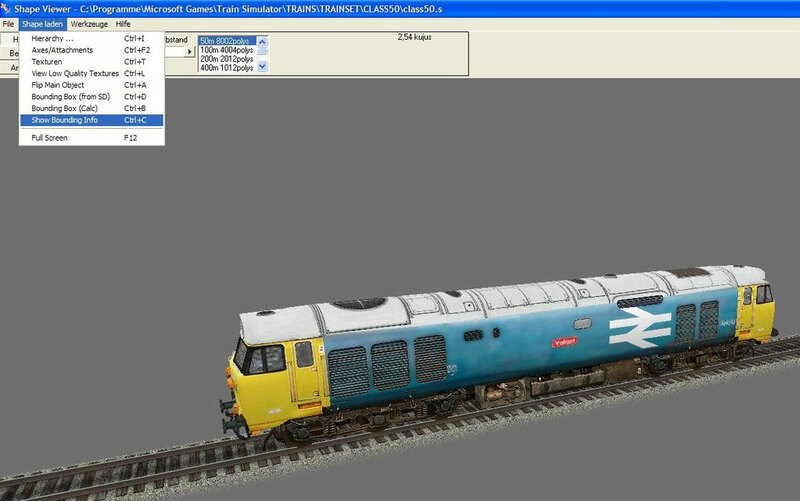 I'll show it you on the basis of a british Class 50 locomotive, which is included in Microsoft Train Simulator. 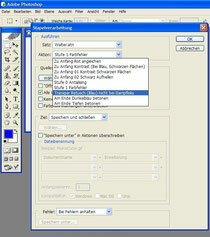 First go to "Show Bounding Info" or press "Ctrl+C". As you can see, the locomotive is with 21m too long for MSTS2loco. 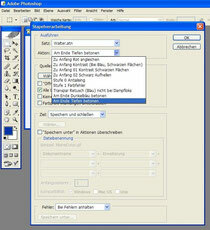 I use the Windowscalculator because I can cache the result. 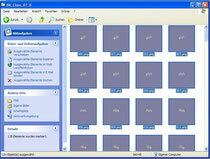 Now open the Shape File Manager and search for your desired model on the left side. When you found it, click on "Options". This takes some time but do not click it again! Only if the window says "Uncompressed" you have got a new selection menu. Take out the tick to edit the other scales. In order: width, height and length. We need the third field, the length. Now paste in (Ctrl+V) the result that we calculated. Important! The Shape File Manager does not work with commas, but with dots! Therefore you must correct the result. 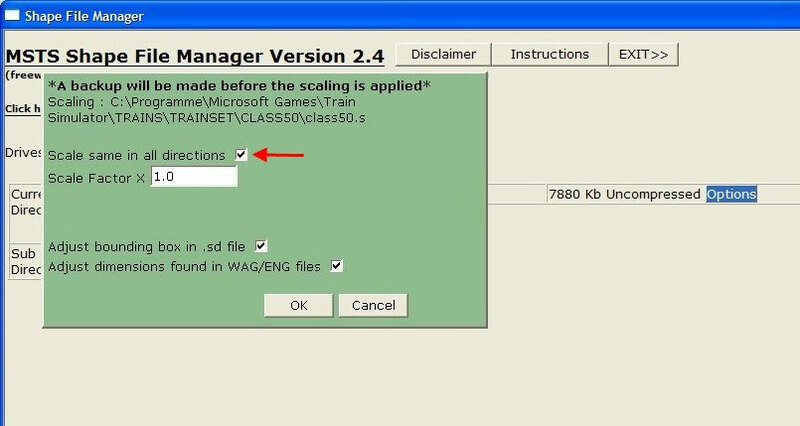 Click OK and wait till a message appears which says that the backup files were made. 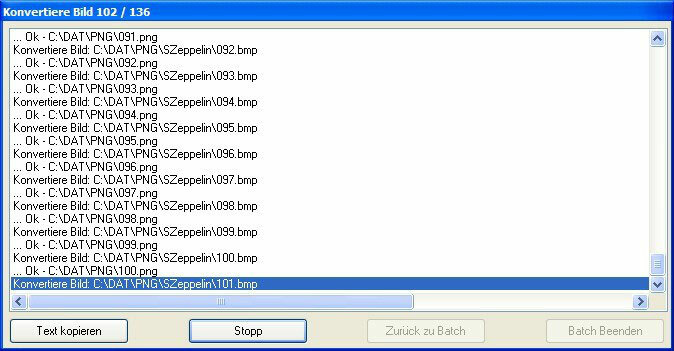 After that, you have to compress the file. Don't try to open the file while it is not compressed! It can damage the whole vehicle or you can get an error message in MSTS2loco. And again, that takes some time. 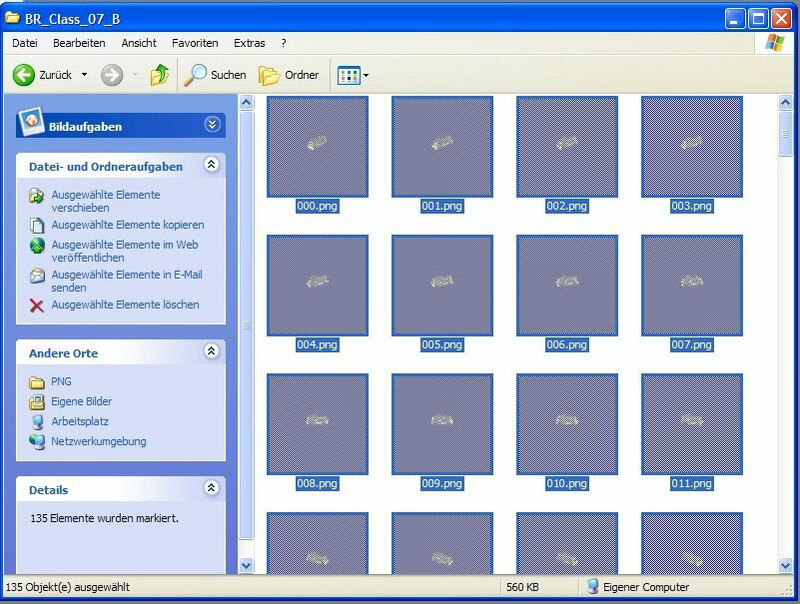 But then you can close the Shape File Manager. Back to the model. This has been shrunk and now it's shorter than before. 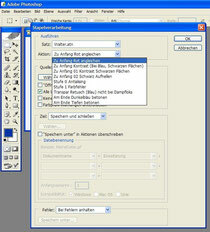 The Bounding Info (Ctrl+C) gives information about the new length. Now you can convert it as it is described above.